This is a wonderful example of the art of the Tinsmith . 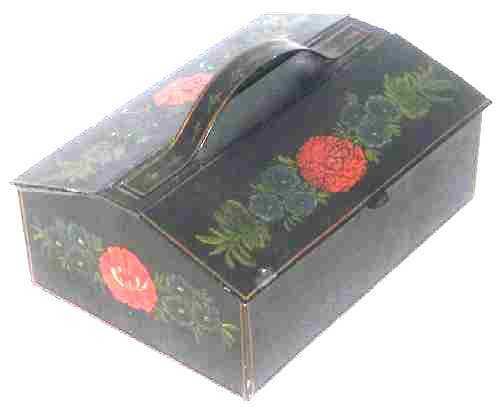 . . a beautifully made six compartment box with strap handle. You can see how the handle is made to fit comfortably in the hand. No sharp edges here! Even the interior sections are turned over at the top so as not to cut. The painted decoration is fabulous! Geometrically balanced, it is composed of a central red flower, a Rose, I think, flanked by three smaller blue flowers with leaves. The decoration virtually fills both of the lids and the two sides. The front and the back of the box is not decorated. The handle is also decorated with sprigs of flowers . . . a red bud and green leaves from one end to the other. The entire piece has gold pinstriping all around. The surface is all- over alligatored and the paint is 99% intact. It is amazing! The box measures 9-1/8" long x 6-1/2" wide x4" high (5-1/2" to the top of the handle). It is not that often that we find painted tin in this condition. American, circa 1800 or earlier.